An unexpected storm with high winds and heavy rain rolled through one recent summer night. Though normally I retract the canopy in anticipation of mayhem, I was asleep at the wheel on this occasion. A 5 am inspection revealed that the one of the two canopy side supports had broken away from it's mount on the side of the camper. In fact the entire mount was rather rudely ripped off the camper. 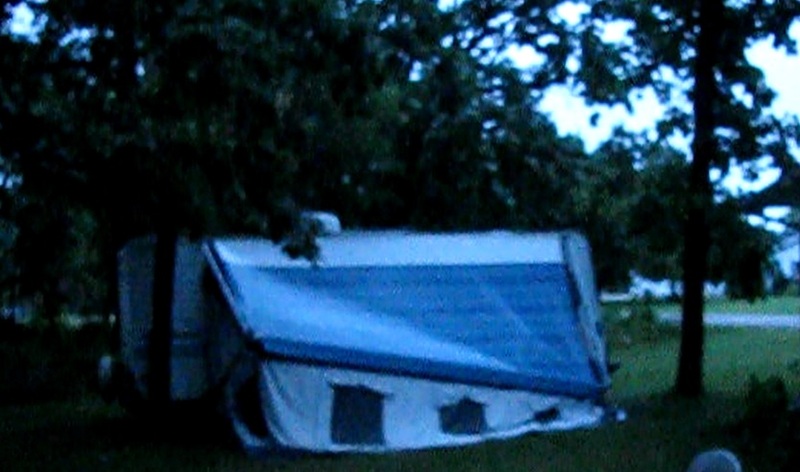 Luckily the canopy was intact and the the screen house as well, but the RV itself would be needing a repair. An examination revealed that one of the support bars, the one on the front side of the camper, had pulled completely away from its mounting bracket on the camper. 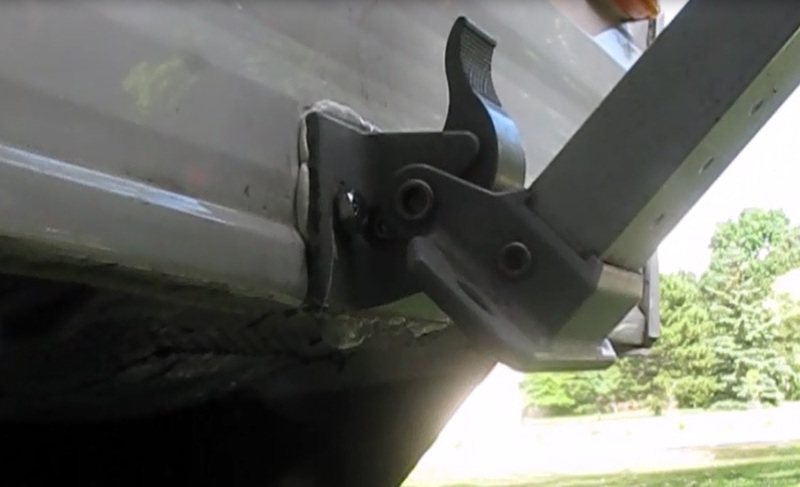 To my surprise, I found the bracket strewn under the camper, with the two three inch lag screws still in the holes. At first I thought that this was a design feature: have the bracket mounted so it could break away, thereby preventing damage to the canopy. I checked the other side and found the screws to be soundly affixed to some solid wood running along the bottom edge of the RV. The next step would be to open up the under-board or belly board, the piece of thin but strong material enclosing the bottom of the camper, and providing a physical barrier against road hazards as well as a vapor barrier. 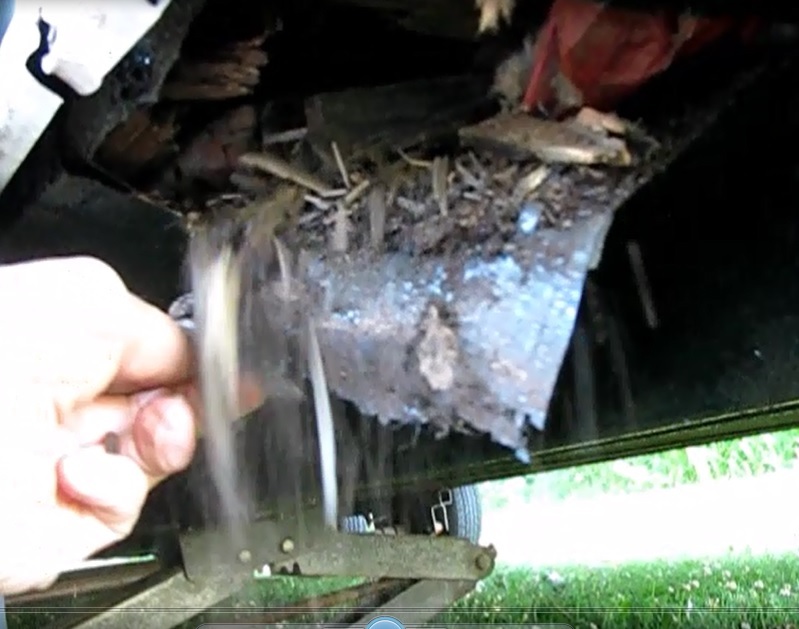 Cutting it apart in the area of the problem resulted in a bunch of wood splinters and dusty debris falling out. 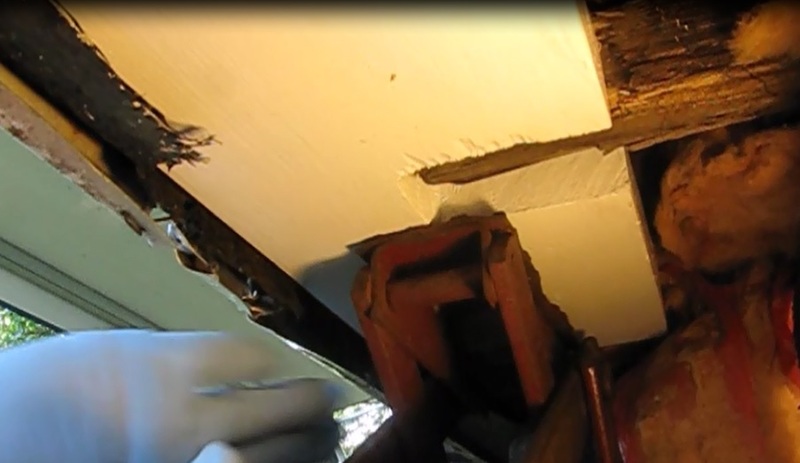 It was rotted away under there and that's why the support bracket pulled away. This was going to have to be fixed and it wouldn't be that easy. Granted, this is rather odd repair, but it does show some of the principles useful in repairing any kind of rot damage to wood. Tools: Saws, reciprocating, hand, circular or jig, oscilllating tool, drill, utility knife. 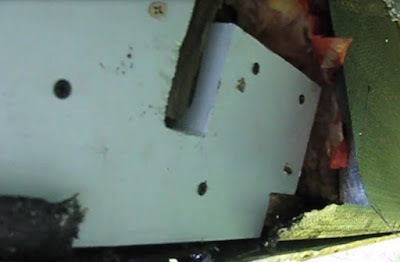 1) Open up the under-board with a utility knife and examine the damage. 2) Check out the parameters of the damage. A piece of a 2x6 board would fit in here nicely, providing more solid material that the original under- support. 3) Cut the replacement board to the rectangular dimension needed. 4) Make a pattern of the form needed. 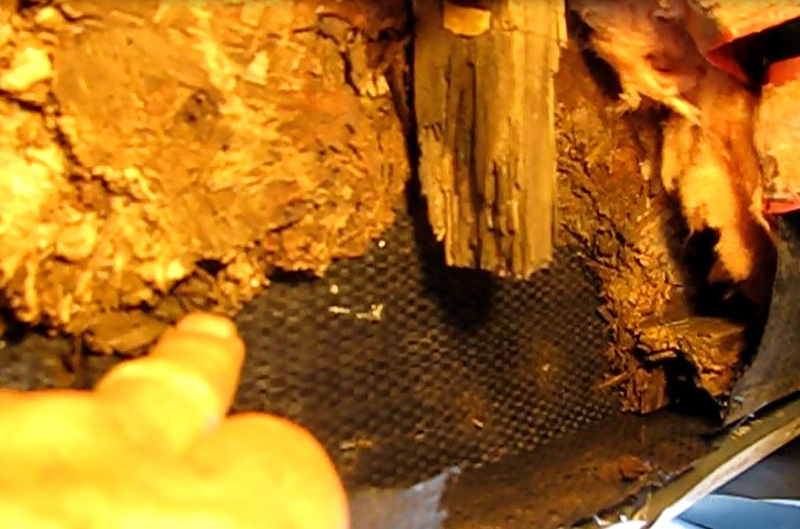 This is the step that is common to any rot repair like this. I use poster board and cut it into pieces that can be fit around the specific edges of the repair and then taped together. There was a 1 1/2" square piece running right through the middle of the repair area that my replacement had to fit around. Do this step and the next two carefully and sanding and filing of the replacement board can be avoided. 5) Transfer the pattern onto the replacement board. Again, try to be exact to avoid work later. 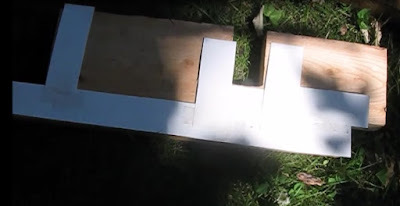 6) Cut the board to the shape needed. Several types of saws will likely be needed. Be exact! 7) Apply wood filler under where the board will fit. The necessity of this depends on the job. I had to account for some missing particle board so I put in several layers of filler to build it back up to where it would meed the replacement 2 x 6 board. 8) Set the board into place. Since I was working underneath, I used a jack to hold it there for the fastening step. 9) Fasten the board to the good exisiting wood under and around the repair. The length of the screws will depend on the situation. I used 2 3/4 and 3 inch wood screws. I consider this like an outdoor job, so I used galvanized screws. 10) Repair the cut belly board with tape and adhesive. 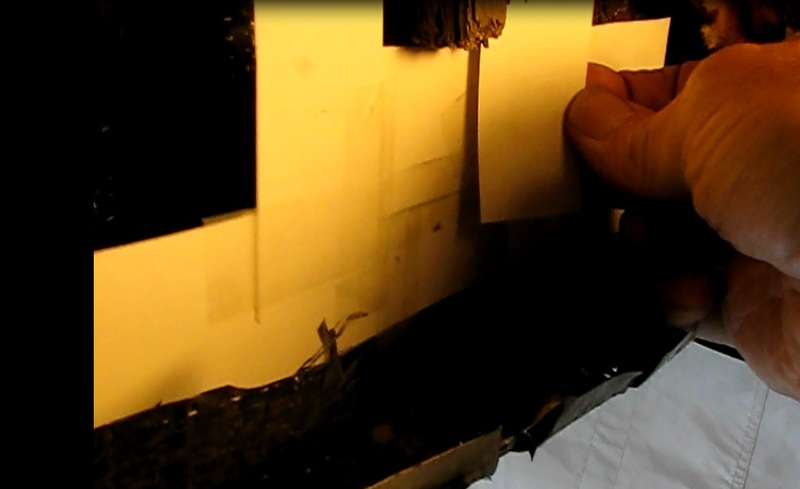 I experimented with several tapes and found Gorilla tape and spray adhesive worked best. There is a special tape made for this application. 11) Finally, I drilled new holes and attached the canopy bracket with weather resistant lag screws.